Cheese straws are magical! Welcome to the cookie press club. And word, no recipe should ever ever ever include margarine over butter. Right? I have no tolerance for margarine. Dude, I love cheese straws. My mom’s recipe has rice krispies in it. I’m wanting to try the palmetto cheese recipe too. I’ve never used my cookie press. In fact, I think I might have donated it. But maybe it’s hidden in the back somewhere…..
Ooh I want to see your mom’s recipe! And yes, should definitely try the Palmetto cheese one. How could it not be awesome? I live for cheese straws!!!! I absolutely love them. If you ever have a big hat wearing, mint julep sippin’, cheese straw eatin’ party, I am so there!! And margarine? Really? My inner Paula Deen just cried a little. Oh how fun would that be??? I have never tried cheese straws before, I’ve had cheese sticks but not the straws. These sound so delicious, I can’t wait to try this recipe out. Do you use all purpose flour for this recipe? Thanks. 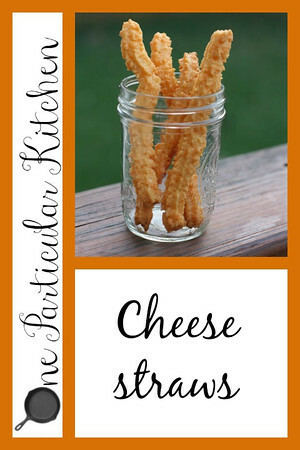 Never heard of cheese straws, but with such easy recipe, I’m bound to make them any time soon! Oh you must! Such a great snack.